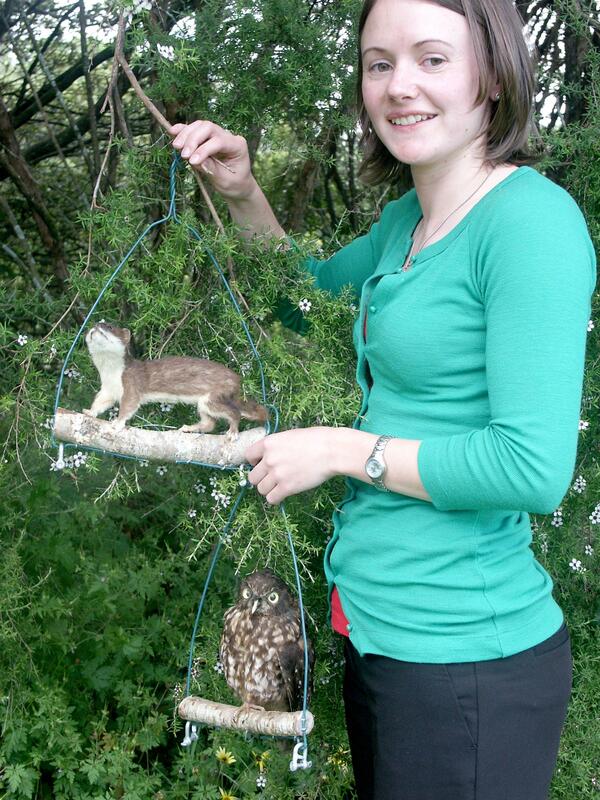 Sarah Whitwell with the stuffed stoat and morepork she has been using to test fear responses of the North Island robin. Endangered native birds are at risk of losing their instinct to recognise and flee mammalian enemies when moved between predator-free and predator-filled sites, says a Massey researcher. 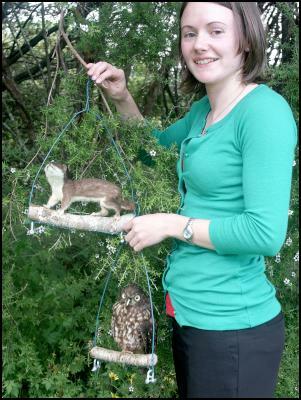 Sarah Whitwell, a biology Masters student at Massey’s Institute of Natural Resources in Albany, designed an experiment using a pulley system to dangle a stuffed stoat and morepork at nesting North Island robins to test their fear responses. She says most robins in areas free of introduced predators such as stoats failed to get into a flap at the sight of an enemy, albeit a fake version. Her research adds to growing evidence that native birds’ responses to mammalian predators are not genetically hard-wired. She says already endangered native bird species would be at increased risk if moved back to wilderness sites with mammalian predators after inhabiting mammal-free conservation areas without some form of predator-recognition training. The responses of robins in predator-controlled Wenderholm Reserve and Tiritiri Matangi Island near Auckland were compared with those in the central North Island, where the birds have long co-existed with native and introduced predators. The long-running fight to save the kakapo has received a welcome boost with the Department of Conservation, Rio Tinto Alcan NZ and Forest & Bird agreeing to extend their successful kakapo recovery partnership for a further two year term. The agreement, first signed in 1990, helps support the Kakapo Recovery Programme and is one of the department’s longest running conservation partnerships. The two-decade strong agreement has already injected over $3 million towards breeding programmes and predator-proof sanctuaries for the critically endangered parrot. The kakapo remains one of New Zealand’s most vulnerable birds but the current population of just over 90 is almost double the number of birds alive when the agreement was first signed. Minister of Conservation, Tim Groser, says the partnership shows what can be achieved when the community and private businesses throw their support behind conservation goals.